I greatly hesitated before deciding whether or not to post this recipe, dear neighbors: you see, cauliflower does not like everybody! If you have no problems at all with sulfites, though, you might want to give it a try. Granted, this vegetable, when boiled or steamed, is mostly notable for its unappealing odor 😷! But after baking it in the oven, mixing it with… rice cakes, beaten egg white OR chick pea / garbanzo juice (my favorite option actually), a few spices for more flavor, you can shape it into very tasty vegetable balls ! Okay, so this is sort of a processed food recipe – but minimally so and in any event one that does not contain any suspicious ingredient. 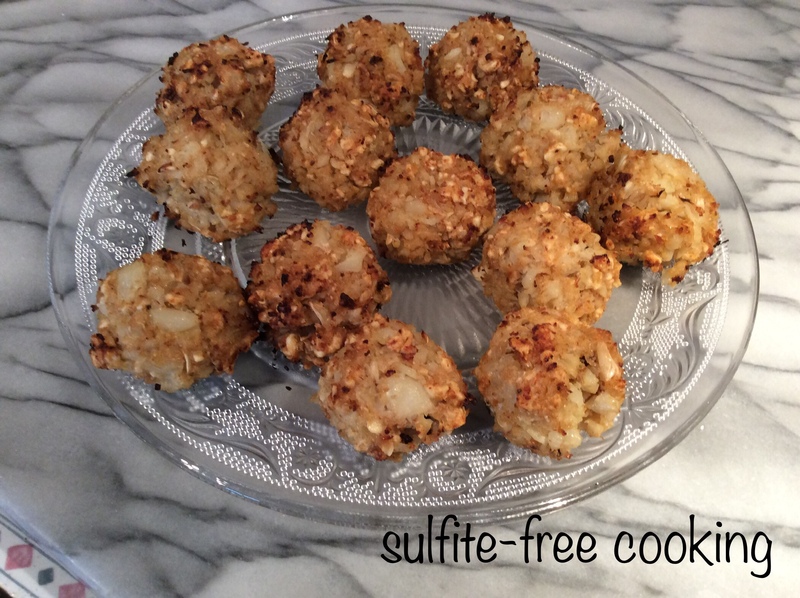 As for a potential connection between cauliflower and sulfites, if you are interested, I go into more details after the recipe. In the meantime, happy cooking ! 1. Run the rice cakes in the food processor. You will very quickly get a mix of very fine crumbs, coarser ones, as well as some bigger chunks. Stop at that point; set milled rice cakes aside and rinse food processor bowl. 2. Now run 300g to 350g cauliflower florets in the food processor. (Please note that a larger amount will make it hard for the balls to hold together.). You will end up with a couscous grain-like consistency. Spread on a baking tray lined with parchment paper and bake for 20 minutes. This will not only cook the cauliflower, but also make it lose quite a bit of weight, actually almost half, as it dehydrates ! 3. Meanwhile, manually crush the surviving remaining big chunks of rice cakes, and add egg whites / garbanzo juice beaten into a soft white fluff (no stiff peaks here), salt, and spices. Mix with a fork and let sit. The cereal will absorb both moisture and flavors. Except for the slightly darker color in the chick pea juice option, there isn’t much difference. 4. Remove cauliflower from oven. Wait till it has cooled down before adding it, not forgetting the olive oil, to the previous mixture. Press small amounts between the palm of your hands to shape into balls and place on lined tray. (No need to change the paper). 5. Before serving, bake cauliflower balls on bottom rack of the oven, at 230°C / 450°F, for 15 to 20 minutes, no more. They turn a light golden color and are pleasantly soft inside, yum ! So much we still need to learn on sulfite intolerance! The last publication I read, published by the University of Florida, under the paragraph “Current Regulation Status of Sulfites” got me slightly irritated: the only advice they have on the issue of eating out if you have sulfite sensitivity, is that you “should become savvy”. Really? Previous refreshing grapefruit salad with homemade gomasio, because it can get hot in winter, just ask my daughter! Next fennel and dried beans in tomato sauce, a quick meal, and let’s not be afraid of the unknown! Lovely recipe, dear Joelle! Unfortunately, as you have remarked, cauliflower does not like everybody, and my husband is one of those it doesn’t like. Ditto for broccoli. Pulverizing rice cakes to mix with veggies is a great idea, though, and I’ll be sure to use it! Thank you Dolly, any tweak to any of my recipes is always welcome, so let me know what you do with it! It’ll have to wait until some more veggies come into season. I need a wider variety. Well, I love cauliflower (and no ill effects on my digestion either), so this is right up my street. Love the crushed rice cakes as a binding agent – have never thought of that! We learn so much from each others blogs. Thanks for sharing your recipe, and also thanks for the click through to my recipe 🙂 Have a good week.